At Laredo Petroleum, the use of natural gas vehicles (NGVs) starts at the top. Chairman and CEO Randy A. Foutch leads by example and walks the talk. Foutch, who is known for having compressed natural gas (CNG) vehicles as his personal vehicles to drive, is also the company’s number one ambassador of the products it produces and sells. Established in 2006, with about 400 employees today, Laredo is an independent energy company with headquarters in Tulsa, Oklahoma as well as operations in Dallas and Midland, Texas. 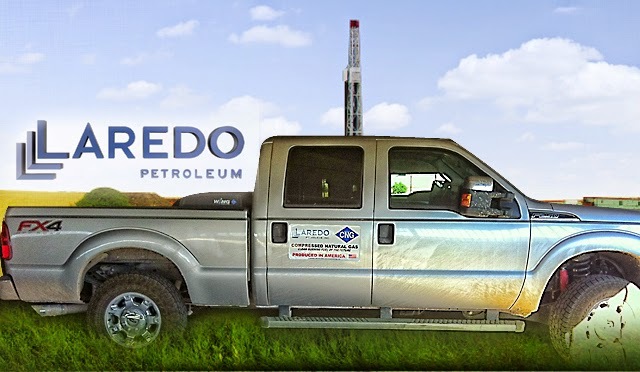 The company focuses on the exploration, development and acquisition of oil and natural gas properties in the Permian region of the U.S.
Laredo has a fleet of about 200 light duty vehicles, all of which are Ford F-150 and F-250 pickup trucks used by field personnel at their Midland, Texas operation. About 40 per cent of its fleet vehicles have been transitioned to natural gas with the goal of having 95 percent of its fleet comprised of NGVs by 2016. In the spring of 2014, Laredo conducted a regular review of its vendors to look for one that would offer ship-through of quality CNG vehicles at the best price and with the most responsive customer service support. After meeting with the Westport sales team and visiting the Westport Dallas facility, Laredo decided to choose Westport and purchased 25 Westport WiNG™ bi-fuel CNG powered Ford F-250 Super Duty trucks. Laredo is in the process of building a semi-private CNG station in Garden City, Texas. It currently uses Apache CNG stations located at Stripes convenience stores in Midland, Texas to fuel its trucks, which each average about 30,000 miles per year.